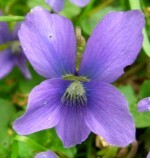 The common blue violet is a herbaceous perennial belonging the Violaceae family that also includes pansies. It is native to eastern US where it prefers moist soil but is drought tolerant when mature so adapts to a variety of habitats including ditches, roadsides, and railroad clearings as well as in fields, meadows lawns and garden beds. Plants grow best when temperatures are cool. They can be distinguished from sweet violet, a native of Europe and Asia, by their lack of fragrance. Both flowers and young leaves are edible and the latter is enjoyed by butterfly larvae, especially Fritillaries, as well as various mammals. The generic name Viola comes from the Latin name for sweet smelling flowers such as stock and wallflowers. Description: A fibrous root system with short, thick branching rhizomes gives rise to a basal rosette of glossy green leaves that are heart-shaped, three inches across and long, sometimes hairy, and have rounded teeth on the margins. The slightly pendant flowers are deep violet to white with a white inner throat and are carried slightly above the foliage on slender leafless stalks in spring. Each flower is about ¾ inch across and has five petals: two upper, two lateral, and one larger lower petal. Sometimes the lateral and lower petals have white hairs near the throat. During the summer enclosed flowers without petals self fertilize and produce capsules filled with seeds that are ejected into the surroundings. 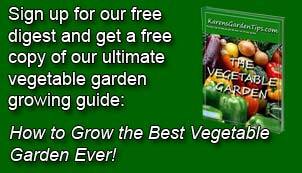 Control: Hand pull or dig out plants in spring before seed production making sure to remove all of the rhizomes. Mowing is not an option because plants adapt by producing smaller plants. In severe cases repeated applications of postemergence broadleaf herbicides can be useful if applied from mid-spring to early summer and from mid to late fall when plants are actively growing. Products containing the herbicide triclopyr are usually effective.